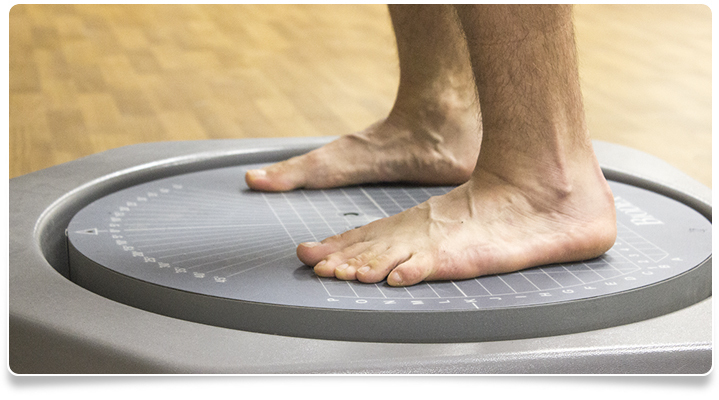 In an ankle sprain, there is damage to one or more of the ligaments caused by overstretching. Ligaments attach bone to bone, and are meant to provide stability to the joints. Ankle sprains are among the most common injuries found in athletics and recreational activities. Ankle sprains can be medial or lateral in nature, depending on the direction the ankle rolls during injury, or can be classified as high ankle sprain. In a medial ankle sprain, an eversion (arch of foot rolling inward) mechanism causes damage to ligaments on the inside of ankle including the deltoid ligament. This type of sprain less common. In a high ankle sprain, an external rotation (toes facing out) mechanism causes damage to the tibiofemoral ligaments. In this case, pain is usually present on anterior lateral leg just above the ankle. 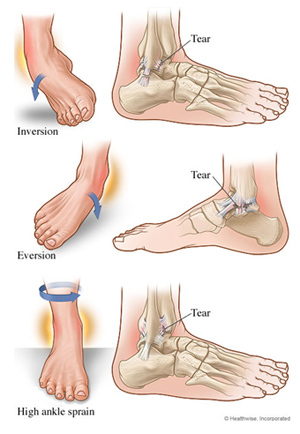 In the most common, lateral ankle sprain, an inversion (rolling onto outside of foot) and plantar flexion (pointing toes) mechanism causes damage to the ligaments on the outside of the ankle including the ATFL (anterior talofibular ligament), CFL (calcaneofibular ligament), and/or PTFL (posterior talofibular ligament). Lateral ankle sprains can be classified into Grades I, II, or III based upon the severity of the sprain and which structures are involved. Knowing which structures are involved is vital in establishing a treatment plan. Protection- small ankle stirrup brace or walking boot. Additionally, your physical therapist could make use of treatment techniques such as soft tissue massage, active range of motion, ultrasound, and electric stimulation. Following the acute phase of rehab and within 5-10 days, various treatment options are utilized over a 3-4 week period of time for an optimal result. The goal during this phase is to restore full strength, stability, and ultimately function of the joint, and includes. What if an ankle sprain goes untreated? If an ankle sprain goes untreated, it can lead to further injury to the joint including chronic instability. Once an ankle sprain has occurred the likelihood of re-injury is much higher, but if conservative treatment is utilized the outcome is generally quite good.